My name is Nicole and we reside in Southern Alberta, Canada. I am 40 and have been training dogs for over 20yrs. I have fostered, trained and rehabilitated dogs for shelters, pounds and rescues for over a decade. Previous to obtaining my first pure bred shepherd I always worked with abused and abandoned dogs. I have raised several abandoned litters also. I have always had a love for our 4-footed friends. I tried doctor prescribed medications and all sorts of treatments and none of them worked right for me. The medication it was discovered was actually dangerous for me to take as I kept getting the rare side effects. Then I learned about PSD's- Psychiatric Service Dogs. Here is a link that explains a lot of the tasks these dogs do and what they are for. I researched them for a year learning how they could help people like me. I spoke to my doctor about the possiblity and he agree that it might be a good option for me. After a year of research I decided to try it but because this dog was going to go out into public with me I wanted a pure bred. A dog that I would know the complete history of and what to expect health wise for the dog in the future. That’s when I started researching breeds. The one breed that I have always loved was the German Shepherd. They are versatile and easily trained if the training is done right. They are also strong willed, which is a very important trait when the dog has to take control in certain situations. The only problem was that the over all public has a fear of the black and tans and the pure blacks. I did remember seeing a White Shepherd when I was little but never since then. So I decided to look. This is when I first learned about the white German Shepherd. For some reason the public had less fear of these beautiful dogs. So I started looking for a breeder. After a lengthy search I found Sheena's breeder. I contacted her and let her know why I was looking for a puppy. If Sheena excelled in everything then my plan was to use her to start our kennel to pass on her traits and be able to donate Service dogs to training facilities. 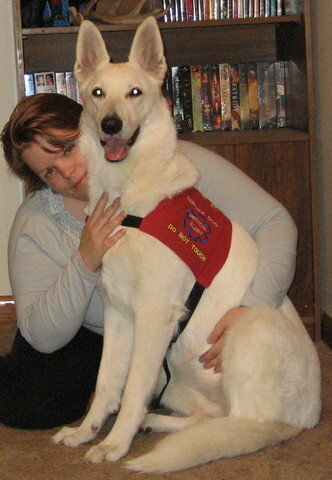 Sheena did excel at Service work and after 2yrs of training became my Service Dog. She changed my life. At 3yrs of age we bred her and she had a beautiful litter of 6 boys. One temperment tested to be a possible Service Dog candidate and I choose to donate him to a trainer that could give him the training he needed to help someone disabled be more independant. He passed with flying colors and worked till he was 8yrs of age. I spayed Sheena after that as life was happening in ways that I could not consider continuing my dream of my kennel and it was put on hold for the next 9yrs. Obviously that meant I would have to start with whole new lines and in that time I learned more about breeding and breeds. I developed a love of the White Swiss Shepherd and decided that was the breed I would pursue if ever my dream came to fruition agian. And it has. My new partner of the past 6yrs, has been a great support in this dream of mine and it has now become his as well. 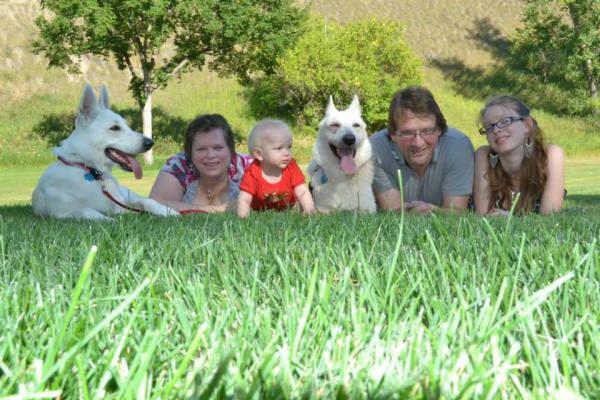 All our breeding dogs only come from FCI registered kennels. All from kennels who test for MDR and the parents are tested as clear. All who test for Hip and Elbow Dysplasia. Also kennels who foscus just as much importance on structure, by showing, as they do for intelligence and drive, proven by trials and offspring working in every type of job possible. One thing I did learn in all this is that there are so few well bred pure bred dogs available for service dog training facilities compared with the huge number of people in need of them. Every year they are discovering new ways that these dogs can help, from detecting cancer before doctors can, helping the blind, deaf, wheel chair bound, there is a new one for people who have a sever allergy to chemical smells, for people who have mental illnesses and epilepsy. The list goes on and on. That is my main wish for any puppies that I breed. I will donate the pups that seem to have these sensitivities to these training facilities for the express purpose of going to people who would not otherwise afford them. For the ones that don't show this potential I would hope to send them to homes where they will be trained in Search and Rescue, Therapy, police work and so forth where these beautiful, intelligent dogs can be worked and trained to keep their minds busy. For the few who end up preferring to be couch potatoes I would prefer them to be trained in Agility and so forth for the socialization and the fun exercise. All of my dogs and the pups they will have must go through obedience and puppy kindergarten, which will be stated in my contract. Now Sheena has passed on at 12yrs of age and it is time for her to pass the torch to the new imported dogs to take up what she started. My goal is to produce outstanding working and service dogs that will be love and adored by their families and an asset to the community.